The rat has the first position in the Chinese Zodiac. The birth years of the rat are: 1924, 1936, 1948, 1960, 1972, 1984, 1996, 2008, 2020. The following are the twelve zodiac signs: Rat, Ox, Tiger, Rabbit, Dragon, Snake, Horse, Sheep, Monkey, Rooster, Dog, Pig. 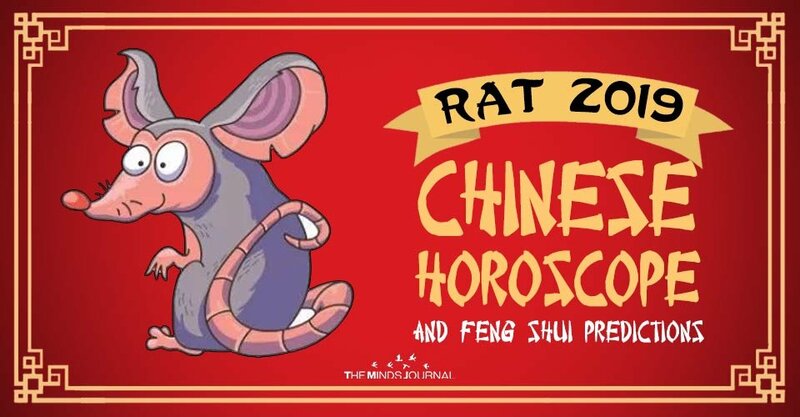 The Chinese Horoscope for the Rat zodiac sign presages that in 2019, the Rat natives will go through a transition period before they pass in the year of their zodiac sign, the Metal Rat Year of 2020. During the Earth Pig Year of 2019, the career becomes a priority. The Rat natives will look and, very likely, will find their direction. Especially in May, when changes, ideas, new possibilities, both professional and financial, will occur. Wood Rat 1924, 1984 A year full of great experiences! Fire Rat 1936, 1996 2019 will be a year of good choices! Metal Rat 1960 A year full of energy! Earth Rat 1948, 2008 In 2019 you will improve your life ! Water Rat 1912, 1972 Establish clear objectives and you will get some good results ! The New Chinese Year beginning in 2019 is the year of the PiG , a year full of prosperity that will support any activity or motion in the Rat’s career. Although it’s not something characteristic for this sign, the Rat might take some risks during this year, which could lead to financial profits from unexpected sources. We shouldn’t forget that the natives can have great achievements even without forcing their luck. Towards the end of 2019, the Rat natives must avoid any type of speculations, especially gambling or real estate. They need to use this time to save money and to keep under control their desire to spend. The Rat natives will need to avoid gestures/actions that can be misinterpreted because this will either diminish their achievements, or it will create enemies or tense moments in the future. In 2019, their sense of observation and self-preservation make them deal perfectly in times of crisis (the important activity moments) when the Rat always finds the best escape method (the live-saving solution). The Rat boss will perform very well as long as he is required to do what he knows. He is the type of leader that will show a great understanding to his subalterns (keep in mind that this applies only on individual humanitarian level), making their problems something worthy of being solved, especially if he has the feeling that the workplace is another family. The Pig should be favorable for you, especially at the beginning of 2019. If you are married, the ambiance within the couple will be affectionate and serene, and the partner will do everything in his/her to see you happy. If you are single, you will need passion, you will dream of a great love. But you will need to be patient. It seems that only at the end of 2019 or the beginning of 2020 you might have an interesting meeting. The Rat is most compatible with the Dragon and the Monkey. The natives born under these zodiac signs will have a very good relationship, extraordinary even for marriage or business. Together, they will enjoy success, happiness, prosperity. The Rat is not compatible with the Horse. Bitterness and antipathy might occur. They don’t have too much in common. They are not going to have a long-lasting relationship. In 2019, those born under the Rat zodiac sign are generally enjoying an excellent state of health. They are very active, which helps them to keep in shape and to fight any possible diseases. At the beginning of 2019, the health problems for the Rat natives often occur due to neglecting the signals sent by their own body. In order to determine us to change the way we approach our diet, attitude etc. in our daily life, the body permanently sends precise signals, which for the Rat, are in the most cases signs of weakness that must be avoided. The most sensitive organs for the Rat natives are the stomach and the blood vessels, arterial hypertension and/or pre or post ulcerative gastric affections being some of the most common affections. Throughout 2019, the Rat natives can become very tense, aggressive, full of nervous tension, and all these can lead to a major accumulation of stress. The physical exercises aiming to relieve the nervous system are very beneficial for those born under the Rat zodiac sign. For the natives born in the Rat year, as for those born in the Dragon, Monkey or Ox years, the Feng Shui experts recommend acquiring a rat statue. The rat has a great orientation sense and an excellent defense and surviving instinct. As with the mongoose, it is said that the rat spits precious gems and expensive jewelry. By being intelligent, cunning and skillful, it can help you prosper in business. Also in 2019, the best Feng Shui remedy for the Rat natives remains the mandarin ducks. They are a symbol of love, romance, and fidelity, affection, and loyalty between partners. They attract the soul mate that you’ve dreamed of.The mandarin ducks bring plenty of luck in love. They are used to avoid strong emotions and tensions in the couple life. They increase luck for marriage and the romantic occasions. They are ideal for single people, who are looking for a new lover, as well as for strengthening the current relationship. Health: A recommended remedy for the Rat natives is the 5 element Pagoda , a symbol of health. Also, place a Dragon Turtle with a nugget in the East sector of your house to ensure the family blessings, a good state of health and longevity. The East sector governs the family relationships, luck and health according to the 8 life aspirations after the Pa Kua method.